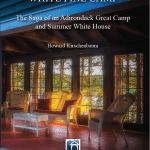 The AARCH Awards Program annually recognizes exemplary historic preservation work throughout the Adirondack Park. We seek examples of sensitive restoration, rehabilitation, and demonstrated long-term stewardship. We welcome nominations from members and the general public throughout the year. Help us spread the word about the good work going on in our region by nominating a project from your community. Annual Nomination Form – please download and fill out this form to nominate a deserving preservation effort.